What is Kablooie all about? Hey style guru. Do you love bright, bold colourful fashion - with a touch of quirky? Well, I am soooo glad you stopped by. Because Kablooie is for the bold, the bright and the fabulous - and that's you! Uh-huh. Absolutely. It's all about statement pieces you can use to build an outfit – a mix of vibrant colours and quirky prints to style your way. 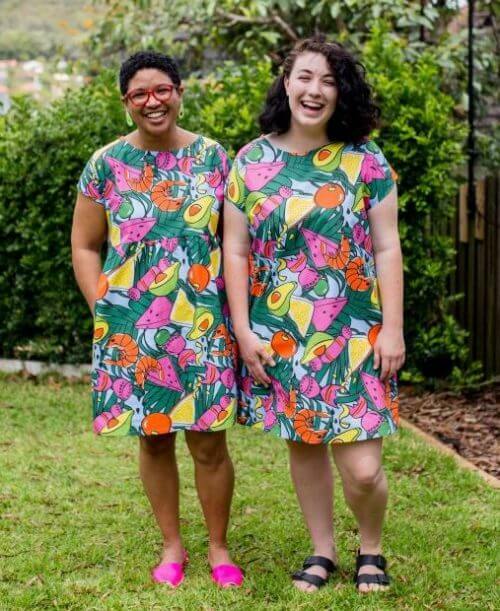 Each piece of Kablooie clothing is carefully handcrafted for you, in Brisbane Australia. Using designs created and printed exclusively for Kablooie customers, insizes 4-24 Because you're fabulous. And you deserve clothes that say that. Amp up your style with your own Kablooie pieces. Big, bold, colourful patterns that you can mix and match, dress up or down. Do your own thing, because you already know what you love. Each piece is handmade to order for you. It’s slow fashion.... that doesn’t take itself too seriously. Cos fashion can be fun, and clothes should make you happy right? RIGHT? Check out each of my designer collections - created in collaboration with independant local designers, and often with a quirky Australian theme. Or my deliciously fabulous, and ALWAYS fun accessories, often custom made to match Kablooie pieces. New collections often sell out fast. To be in the know about restock dates and times, and even get some sneaky pre launch access, join my VIP email group to get the goods emailed straight to you. You'll also get a little bonus welcome gift - a $5 shopping voucher, exclusive deals and sneak peeks of all the good stuff. Oh, and sometimes I make RAD limited edition stuff that's not on the website. If that sounds like your thing, check out my fabulous private shopping group on Facebook and get involved in the fun. It's exclusive and its super popular - join in on shopping nights and feel the adrenaline rush! Oh, and you wanna know about me? Read on! Lover of colour, words, puns, pattern clash and donuts. Definitely not a perfectionist. 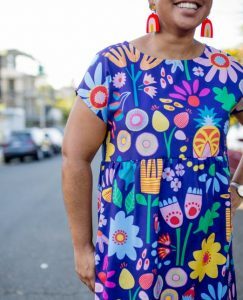 Keneena Fanning is the creator, maker and doer at Kablooie Store, her micro fashion label full of big bold happy pieces. Kablooie Store's vision? To create fun fashion pieces for you that look fabulous, and make you feel deep-down happy! Now, in between dreaming up new colour clashes, collaborating with amazing creatives and coordinating a growing group of seamstresses and employees, Keneena finds joy in the happy chaos of family and church life, loves to exercise and dreams of one day doing one handed pushups. Followed by a pepperoni pizza. Life is busy, crazy, and incredible.